More than 12 million people in the UK visited an internet retailing site in the run up to Christmas, according to figures from analysts Nielsen. The figure represents 60% of the country's online population - an increase of 3.8 million on the same period last year. The survey shows that buying online is now a part of everyday life for millions of people, a spokesman said. It also suggests the UK has the most web literate shoppers in Europe, with nearest rival Germany registering just over 10 million visits over the same period. Global bookselling giant Amazon topped the Nielsen chart, with Argos claiming the title of the most visited UK High Street retailer on the web for the second year running. The top ten includes the highest number of UK High Street retailers since the survey began, a Nielsen spokesman said. Price comparison sites, such as France's Kelkoo and Dealtime are also proving increasingly popular. Nielsen analyst Tom Ewing said: "These figures represent visitors, not necessarily buyers. "But the UK's conversion rate from browsers to buyers is also the highest in Europe so it's a safe bet that actual online spend has risen over the year. "The figures suggest that shopping online is now an everyday part of more than half the British online population, particularly at Christmas. "In fact the UK has become Europe's capital of e-Commerce." The Nielsen figures follow a report from Internet Media in Retail Group (IMRG), which suggests e-tailing is growing 19 times faster than conventional retailing. IMRG said online sales were 79% higher than a year ago, with shoppers "deluging" e-tailers with �949m ($1.5bn) worth of orders in the three available Christmas shopping weeks. This compared with year-on-year growth on the High Street of 4.1%, according to British Retail Consortium figures. Meanwhile, separate figures also released on Monday show a 9% increase in internet subscriptions in the UK. The figures, from the Office for National Statistics, were for November 2002, in comparison with the same period last year. The increase was driven by broadband, with permanent connections to the internet up 272% on the same period last year. 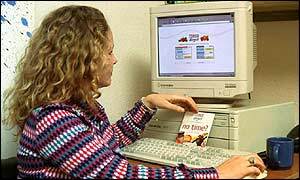 Dial-up connections grew 1.6% year-on-year, but declined by 0.4% between October and November 2002. Permanent connections made up 9.3% of total subscriptions in November 2002.